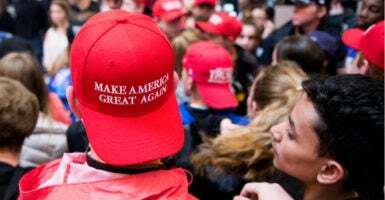 We watched the original video of the young white Kentucky boys decked out in Make America Great Again gear mocking an old Native American man and, to say the least, we were disappointed. The teens were in the nation’s capital for the March for Life. The Native American man, 64-year-old Nathan Phillips, was on the mall for the Indigenous Peoples March. The footage of their encounter, shot Friday, seemed to support the false narrative that President Donald Trump is a racist and by default anyone who supports him is a racist. The young Trump supporters were accused of being culturally insensitive at best and down right dirty racists at worst. Less than 24 hours later, a host of live videos of the full incident emerged and made it clear that the grown-ups were the childish instigators and the teenagers were actually just being teenagers. The full story, if anyone on the left would care to report, is really rather simple. This large group of white boys from Kentucky standing on the National Mall wearing MAGA hats chanting were not harming anyone. And yes, they were exercising their First Amendment rights. But Lord help their silly selves. These teenagers were ripe for the pickings of Indian elder Phillips and the Black Hebrew Israelites activists. In the full video, it is clear that Phillips and a small group of Black Hebrew Israelites activists approach the boys as they are chanting. It is the adults who begin hurling F-bombs and being the aggressors. The mainstream media will deliberately paint false narratives if it makes Trump look bad, even if it means ruining the life of a young kid who did nothing but stand and not move when an old Native American man started chanting in front of him with a drum. Come on, people. That was strange! What was the kid supposed to do? Because of the narrative that has been painted, the teenager has been given national Twitter hate from political figures like Elizabeth Warren, activists like Shaun King, and celebrities like Billy Crystal. Reza Aslan even tweeted, “Honest question. Have you ever seen a more punchable face than this kid’s?” These are adults with hundreds of thousands of Twitter followers who have not issued an apology or deleted their tweets. We don’t expect the mainstream media to go full coverage on the correction. The egg on their faces would be too much for them to bear. But the grown-ups, particularly those with huge media platforms, should be actual grown-ups and apologize.